Often, the highlight of travel for me is grocery shopping in whatever new town I’m in. Sometimes it’s at farmers markets, sometimes just at Whole Foods, but every time I always find some new vegetable or product to play around with. A few weeks ago during a weekend trip to Richmond, I stumbled across the newly released Beyond Meat in the vegan/veg fridge case. Billing itself as the closest vegetable-based meat to the real thing (vegan–comprised mostly of soy, pea protein, and amaranth–and praised by Mark Bittman in the NYTimes), I did indeed find it freakily chicken-y–though not enough so to fool anyone if served on their own. The texture closely resembles the original animal–dense (but not like a rock), shreds easily enough when bit into or chopped–and the taste does taste “just like chicken” (if not a little salty). I can see why some taste testers were put off by it for being “too real,” but…isn’t that the point? I tested the not-meat meat out in some super awesome, super easy tacos (what else! ), mixing together a simple crema of salsa verde and vegan sour cream, and chopping together mango, cherry tomatoes, and jalapeno. Summer in a tortilla. I don’t think G was sold on the “chicken” as much as I was, but he did think that overall the tacos were pretty rockin. If I could buy Beyond Meat here in Roanoke, I definitely would–so, hey, Co-op, wanna get some in please? Anyone else tried out Beyond Meat? I’m curious to know if others think it’s too meaty or just right! In a skillet, warm the oil over medium heat. Add the “chicken” strips and cook till warmed through. Set aside. In a bowl, mix together the cherry tomatoes, mango, jalapeno, lime juice, and salt. Add lime juice and salt to taste. In another small bowl, mix together the sour cream and salsa verde. In a large pot, combine all the ingredients. Simmer for 20 minutes, until the tomatillos soften. Transfer to a blender and blend until smooth. Add more salt and spices to taste. If canning, process in a hot water bath for 20 minutes. I love the southwest flavor (perfect on a sprouted corn tortilla with fresh salsas, avocado, or other fruits and veggies!). The texture is awesome but I have to say the “original” flavor was a huge turnoff. The flavor was reminiscent of a deep rich chicken stock and I found it to taste like chicken soup. Not being a fan of chicken, I didn’t love it but I love the texture and flavor of the southwest flavor strips. i just saw beyond meat at whole foods this weekend and considered getting it. but, i just don’t have a taste for meat flavored foods… i wanted to buy them for dayv, though, to try putting them on a sandwich or something, but wasn’t sure if it was worth it. now, i definitely want to give them a try, if not just for something new for dayv to enjoy. maybe i’ll make him these tacos! Absolute fan of Beyond Meat! I found this last year and have been hooked and even the hubby loves it! It is without a doubt the BEST mock meat on the market!! Don’t knock til you try it! My friend is a traveling sales rep/culinary educator of sorts for Beyond Meat, and when he’s in town he brings along samples of the dishes he demos at Whole Foods. I think it tastes and feels very much like chicken, if perhaps a little chalker in texture. I didn’t like actual chicken all that much back in the day however, so I’m not that crazy about Beyond Meat! I’m not sure they sell it anywhere other than at Whole Foods – maybe they’ll expand in the future? I love Beyond Meat, but I admit it had to grow on me. When slow cooked in a pot pie or stew, it gets really nice and soft. But I like it straight out of the package, too. I got a package at Whole Foods last week and we ate half of it atop a salad and the rest in summer rolls. I thought it was pretty good and I’d buy it again, but I really don’t know if it tastes like chicken. It didn’t freak me out, but perhaps I have no idea what chicken tastes like any more. I did think that the fact that it was a bit drier than other brands like Gardein made it a bit more chicken-y than usual, but maybe that’s just because my mother always overcooked chicken? I think I’ve just written the word chicken so many times it’s lost all meaning. My local Whole Foods carries it now but I haven’t tried it yet so I can’t comment on its meaty properties. Your tacos look super yummy! Love the mango salsa in there. I am always hesitant about mock meat, but will definitely look out for this one the next time I am in Whole Foods. I’ve seen it at Whole Foods but I haven’t tried it yet. Thanks to this review, I’ll give it a shot! While I can’t stomach the thought of real meat, I don’t mind lifelike fakes. I ate meat until I was 17, and I sometimes miss the idea of it, even though the reality turns me off. 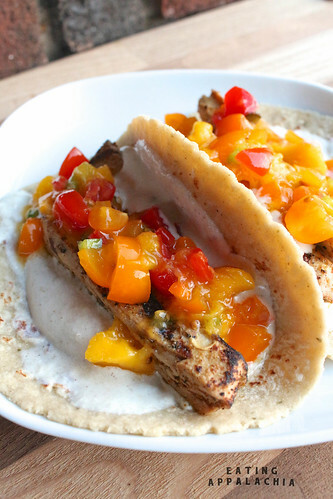 Brilliant recipe and picture, but wow, I am so totally not into beyond meat! The only way I’ve found it edible is to marinate it in something and use it in a dish. I find the out-of-the-box flavor bland and artificial, and the texture is just… not worth my time. I was also really tickled by the fact that the so-called “Southwestern” style was so incredibly mild (note, lacking in character completely) that I was able to use it in thai dishes. Yeah. Smell ya later, Beyond Meat!